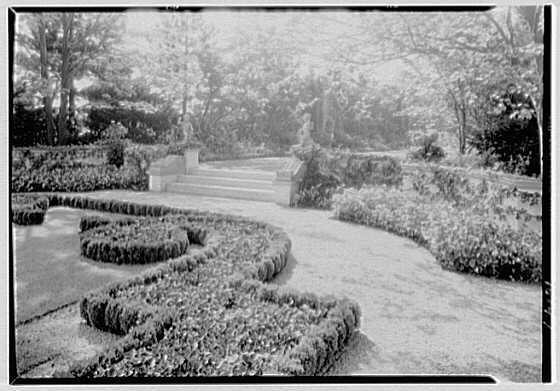 The garden and playhouse to 'Sunken Orchard', the Charles E.F. McCann estate in Oyster Bay Cove. Click HERE to see the brochure from when 'Sunken Orchard' was for sale. Pictures from the Library of Congress. Helena Woolworth McCann, the original owner of Sunken Orchard was the least troubled of old man Woolworth's children (although, admittedly, the bar wasn't set very high). One of her daughters was the first wife of Winston Guest (later CZ's husband), and thanks to Helena's foresight, a bit of the Woolworth money still exists in the hands of her descendants. 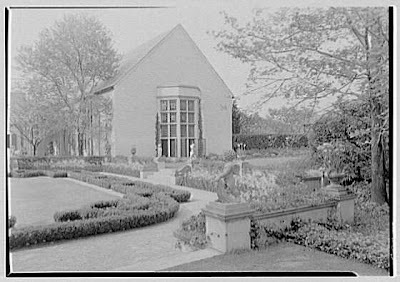 For you "The Two Mrs. Grenville" fans, the tennis court building (see brochure) at Sunken Orchard was the site of the Woodward murder. I went to the Belair Stable Museum in Bowie a few years ago and Russell (the caretaker) told me of a story that when Ann went to visit the stable, she ordered the shrubbery outside the stable removed. Well, when Elsie Woodward got wind of it, she had her landscapers replace whatever was removed. Ann then would have the shrubbery removed, then Elsie would have it replaced to the point where she ordered Billy to have Ann barred from Belair Stud altogether. This was abt the time when Nashua came into prominence (1954-55). Excellent dish Magnus and Laura. Since everyone is obsessed with Playhouses, tennis courts and old estates I have a nice post on one of the few remaining. Mum's the word, since you will guess. It is a lucky break for me. I hope you will enjoy the post and spread the word. If you ever are in the Collinton/Bowie, MD area, please check out the Belair Mansion & the Belair Stable Museum...both are free. Ask for Russell @ the Stable Museum, he'll tell ya lots of stories abt the Woodwards. Both places are within walking distances. William J. Levitt bought the Belair Stud in 1957 for over 1+ million, alot of which went to the trusts to Ann, Woody & Jimmy. That & the sale of Nashua & all the Belair horses too went to their individual trusts. One more thing...Palm Beach Post has a free archives section dating from 1888-1978. Thank you Zach for this !!! !..tres manifique !!! Laura, love your stories about Belair and the Woodwards. If you haven't already, get a copy of "This Crazy Thing Called Love," a bio of the Woodwards by Susan Braudy. Do share some more stories!! In 1955, the Woodwards were staying at Hermitage Farm in Lexington, KY as guests of Warner & Harriet Jones for the Ky. Derby. Harriet recalls Ann Sending back her tray, ordering grapefruit juice instead of orange juice and toast instead of biscuits. Later, a maid asked Ann if she needed a dress pressed. Ann gave her 3 garments. She also wanted the buttons on 1 garment moved over an inch. Love it, Laura! More anecdotes, please!! One thing is for certain. In Woodlawn Cemetery, Elsie did have the final say after all. She made sure Billy wasn't near Ann in 1975. Think of Bette Midler's song title...'From a distance"